Trying to find affordable self-employed health insurance options isn’t easy. There are many choices but not all of them are within your budget. Finding health insurance is often the greatest hurdle, one that gives workers pause before jumping headlong into self-employment. If you're thinking about going freelance, you may be wondering: Are there affordable health insurance plans for freelancers? Am I able to purchase private health insurance, or do I need to buy a government health insurance policy? This can make it frustrating to figure out whether or not good health insurance coverage is worth breaking the bank. There's not one easy answer that suits every person, but understanding how health insurance for freelancers works and knowing what options are available will help you make an informed decision. What is a Self Employed Health Insurance? 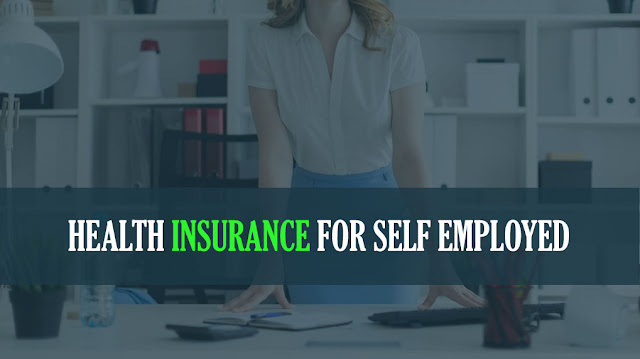 Self-Employed Health Insurance: Freelance worker must apply for health insurance when he/she has decided to work independently as a Self-Employed person or a freelancer. A Self-Employed worker, independent worker, or freelancer is a person who works on his own and doesn’t work 9-5 for any company. As a Self-Employed or freelance worker, one can enjoy many work facilities and flexibility, as well as work-life balance, but they have to manage everything related to their work, by themselves. What are the Best Insurance Options for the Self-Employed? The Health Insurance Marketplace provides great coverage options for those who are self-employed. You are eligible to enroll through the marketplace if you are an independent contractor, consultant, freelancer, or other type of independent worker who does not have any employees. There are several categories of coverage to choose from with plans containing low premiums. Your savings will depend on your projected net income for the year you are applying for coverage. This type of plan is most affordable when it comes to monthly costs. While paying higher deductibles, you pay lower monthly premiums which may be extremely beneficial in the case that you and others on the plan are in good health and not prone to unexpected accidents or traumas. Millions of Americans are given low cost or free coverage through Medicaid including those with low income, disabilities, the elderly, and families. Even if you don’t qualify for Medicaid based on solely your income, it is worth applying for as you may be eligible in your state. There is no open enrollment period, therefore you can apply at any time. Even if you are not legally married, you may qualify as being in a domestic partnership. If you and your partner share a home and live a domestic life together, you may be eligible for coverage under a Family Coverage Plan, as long as you and your partner are not married to anybody else. There are often several tiers when it comes to health insurance plans. For example, there can be Platinum, Silver, or bronze, all which offer different coverage at different costs. Utilizing a broker or agent is a trusted resource with a great understanding. All that is needed from you is information regarding your budget and needs, and they will assist you in finding the best health insurance for self-employed workers. The best part is, there is little to no fee to use one. Depending on your income bracket, you may be eligible health insurance at a reduced or no cost. It is useful to know what subsidies you qualify for while finding the best plan for you. An increase in income will result in an increase in how much you pay for health insurance. Be mindful that if your income varies from one fiscal year to another, it will have to be reported accordingly. You may be subsidized if you overestimate your income from one year to the next. Conversely, if you made more than you estimated you would in a given fiscal year, your subsidy may be reduced. Where you live has a big effect on premiums you may pay for healthcare. Differing competition, federal, state, and local rules, and cost of living affect this. Population per capita may also cause an increase in healthcare premiums. Breaking that bank on a health insurance plan as a self employed person is obviously not ideal, but it’s also something to pay close mind to. You don’t want to cheap out on your healthcare coverage in order to invest your money in other parts of your business. Don’t get coverage in order to avoid a penalty, get it and use it for all that it is worth. You never know when you may need it in case of an emergency. A good rule of thumb is to know that the lower a plan’s deductible is, the higher the premium will be each month. It may sound like bad news, but it is helpful in reaching your deductible faster. Getting a long term plan is much more safe than getting one that is short term. Short term plans may be cheaper to come by, but they do not meet the standards required by the Affordable care act meaning you may receive discriminatory treatment. Insurers can charge more for healthcare plans that include more than just one individual. If you have a spouse, it is beneficial to find out the cost being a dependent on their plan prior to getting a new plan altogether. Simply put, the risk is the unknown. And while no one likes paying high monthly premiums for health insurance, you would probably sleep better knowing that if you had to go to the emergency room, you won't have to worry about how you'll pay for the cost of that visit. Even though lifestyle habits like eating nutritious foods, exercising regularly, managing your stress and getting enough sleep can all help you ward off certain medical conditions, your health isn't always within your control. With today's society allowing business to be performed easily with a click of a mouse, it is no wonder the Internet has grown to allow the entire world to be connected 24 hours a day. It has allowed many people to quit their jobs, move across the world, and become self-employed. Individuals, who would have normally worked for a company, have now found the pleasures of being their own boss. Technology has opened many new age business practices where email and instant messaging is the preferred source of communication with clients. Becoming your own boss takes self-discipline. The certain luxuries like health insurance and a 401K plan, which we may have taken for granted while working for a corporation; now is an extra added expense which has to be considered. Things like health insurance which is automatically included in many full time positions, now must be researched, compared, and considered. Usually the monthly cost can be much more expensive since the self-employed individual is now paying the entire bill, not just a small percentage. What are the options available for a person who chooses to work for themselves? Self-employment allows deductions to be taken out for health insurance as well. The general rule is the health insurance has to be established through the business; just paying Cobra to continue the coverage does not follow this rule. By taking the full income made and subtracting half for your self-employment taxes, plus taking out any other deductions, the left over money is the amount you are allowed for health insurance expenses. This can only occur when you are fully paying your own benefits. Depending on the type of business can lead to different coverage options. For example, freelance writers have different organizations they can join. A benefit of associating with career groups is health insurance companies then offer discount plans to the organization and their members. Another option is a discount health plan. Instead of health insurance coverage, the individual has a choice of medical, dental, and vision plans. A monthly fee is paid and certain doctors and practitioners are in the network. This means certain physicians participate in the discount plan and accept the partial payment. The individual is responsible for the remainder of the doctor's bill. Other discount plans will have the patient pay the entire bill to the doctor, which is already at a discounted price, and then send a claim form into the company. For example, the doctor's bill with the discount is $50.00, the patient pays the full amount before leaving the office. The claim form gets sent into the discount health plan by the patient, and two weeks later, a check for $40.00 arrives. The total cost for the one doctor visit was $10.00 out of pocket. With many of the health insurance options being offered for self-employed workers, prescreening, referrals, and rules pertaining to the amount of visits allowed per year can apply. Researching all the options before deciding on the plan which best suits your individual or family needs is suggested. Websites can give free quotes for the health insurance companies or discount health plans. If you find making a decision is too difficult with all the options on the Internet, there are insurance agents who can help explain the pros and cons of each. Finding an agent who is reputable can be found through referral services or by asking other self-employed businesses. 1 Response to "Best Health Insurance For Self Employed"